Another Microsoft patent has been spotted, and this time around it’s for a nifty little accessory that is not only designed to act as a holder for the Surface Pen, but will also charge the stylus. 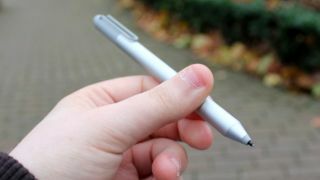 The invention is essentially a small loop that would allow the pen to be attached to the side of the Surface device, but it also contains an “inductive element formed as a flexible loop” around the stylus. The latter would use inductive charging to juice up the Surface Pen, drawing power from the USB port which the accessory would also feature, allowing it to be plugged into its host device while it’s attached – and thus dispensing with the need for a battery to power the stylus. This, then, makes for a considerable improvement over Microsoft’s current Surface Pen Loop, the fabric loop which has an adhesive strip so you can stick it to your Type Cover to provide a pen holder. Of course, this existing solution doesn’t have any charging chops, and what’s more some reviewers have complained of it falling off and leaving a sticky mark on their cover. So a neater solution with added benefits wouldn't be unwelcome, that’s for sure. Lest we get too carried away, as always we need to bear in mind that this is just a patent, and big tech firms file a whole bunch of these things with most of the innovations therein never seeing the light of day. The most recent developments on the Surface front have been the launch of the new all-in-one PC – which you’ll need deep pockets for, not to mention plenty of patience in terms of waiting for shipping – alongside a fresh Surface Ergonomic Keyboard which aims to reduce the strain on your wrists and comes with a fabric palm rest.